Cisco Systems Inc. slashed its long-term forecasts, acknowledging an end to an era of scorching growth after cutting thousands of jobs in a sweeping four-month reorganization. The reduction in projections had been expected from a company grappling with both nimbler rivals and a rickety global outlook for government and corporate tech spending. Yet investors pushed its shares 1.6 per cent higher, relieved the overhaul was bearing fruit: reducing costs and setting Cisco on a path for slower but more stable growth. CEO John Chambers in April launched a broad restructuring after declaring that the erstwhile Wall Street darling had lost its way. That included plans to reduce its workforce by about 15 percent — with nearly 13,000 taken off its payroll so far — and shutter its Flip video camera division. Investors have turned cautiously optimistic at the pace with which the revamp has progressed. And on Tuesday, Chambers said customers he spoke to in the past 120 days had all pledged to either keep their spending with Cisco intact, or even increase it. “Cisco was very upbeat. It sounds like their efforts in terms of streamlining the company and simplifying the structure are paying off and allowing the company to execute better at least in the near term,” Sterne Agee analyst Shaw Wu said. Analysts generally applauded the speed with which Chambers has restructured the business in roughly 120 days. Sources familiar with the situation told Reuters this week that the 62-year-old CEO is looking to end his 16-year run on a high note, with the company on firmer footing. They said speculation has centered around a succession by the likes of Silicon Valley veteran and Oracle president Mark Hurd once Cisco returns to stable growth. Cisco — a bellwether for the networking industry because of its global, diverse clientele — shaved its long-term revenue growth target by roughly half to 5 percent to 7 per cent from 12 to 17 per cent previously. The new target was also below Cisco’s estimate for total market growth of 7 to 8 per cent which raised eyebrows among some analysts. But it forecast 2012 gross profit margins that were better than investors feared. Cisco also said earnings would grow at about 7 percent to 9 per cent in the coming three years. “Growing earnings faster than revenue is also a plus. This is Cisco’s new world,” said BGC Partners analyst Colin Gillis. The Company that once consistently clocked double-digit revenue growth is now comfortable with long-term single-digits. Analysts took heart however in a seeming confidence in its ability to protect margins against aggressively priced rivals. 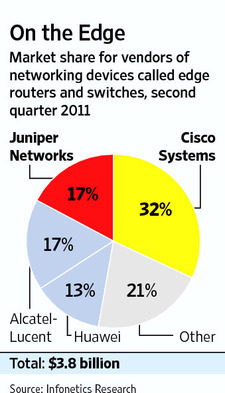 Rivals had undercut Cisco in past years, pressuring margins and chipping away at its market share. Analysts worry that efforts to ward off the competition might pressure margins. Chambers declared war on Tuesday on rivals from Juniper Networks — which he said was at its most vulnerable — to China’s Huawei. At Cisco’s annual analysts’ day, he vowed to battle Huawei on its home turf to bolster a global fight against the Chinese company, which he singled out as a “very tough” competitor. Chambers also said he wants Cisco to generate 40 percent of its long-term growth from emerging markets versus 20 per cent now. In the meantime, the executive said he was seeing positive signs from Cisco’s existing customers. “I haven’t called on a customer with Cisco in the last 120 days who isn’t going to keep their spending with Cisco, or increase it,” Chambers told investors. On Tuesday, Chambers said the company sees its total addressable markets — spanning everything from Internet routers to switching — growing some 7 percent to 8 per cent annually on average in the next few years. Right, competition between Cisco and other network rivals such as Juniper, Huawei, HP never stop and may become more fierce in the future. To keep its leading role in the networking solutions, it is still a long way to go and more hardships to face. Cisco, Juniper, Huawei, and also others, good luck!